Fermentation is an integral part of the brewing process. Fresh wort from the brewhouse is placed into vats or tanks and yeast is added. The yeast consumes the sugars in the wort and converts them into ethanol and carbon dioxide, and along the way, generates heat and multiplies exponentially. 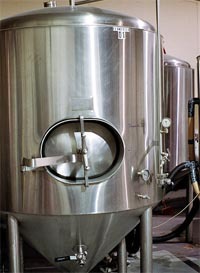 In today’s modern brewing, fermenters are typically enclosed stainless steel tanks, wherein the entire process takes place. Carefully managed yeast strains are employed and temperatures are controlled. Before the advent of modern metals, beer was fermented in tanks or vats of various configurations, mostly made of wood. Some were lined with copper or otherwise sealed and all were either open to the air or vented for pressure relief. Some breweries, mostly Belgian, relied on wide, shallow, open fermenters to capture wild airborne yeast. Others left their fermenters open to facilitate cooling, Co2 venting, or to allow access for a variety of production processes and procedures. In an era preceding mechanical refrigeration, basically before around 1900, lager breweries would run the hot wort from the brewhouse into wide shallow pans to facilitate cooling before moving it on to the actual fermenter. These “coolships” were much the same as the Belgian open fermenters and were adopted by the pioneering breweries of the gold rush years in California, including Anchor Brewing. The main difference being that the American brewers added their own yeast and the wide surface area served the principal purpose of radiating off the heat generated by the fermentation. 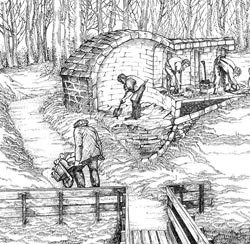 Icehouses were stocked with ice from nearby lakes and ponds to cool fermenting beer during warmer months. German-style lager breweries in the Eastern part of the USA cooled their fermentations with ice harvested from frozen lakes and ponds during the winter months and stored in ice houses for use throughout the year. Ice was not available to the early brewers in California because of the temperate climate, so they had to improvise. 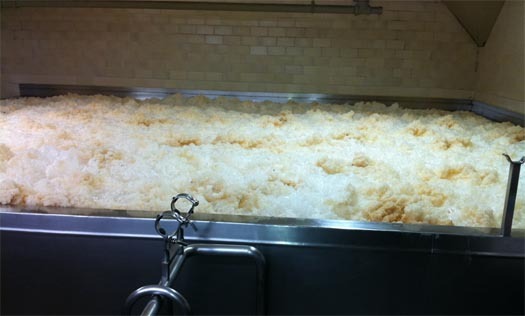 Today, Anchor Brewing is the only American brewery that still employs open fermentation on a production scale. Although we have modern equipment and our fermenters are made of stainless steel, we have kept this process as part of our brewing heritage. We use the “coolship” configuration fermenters for our signature Anchor Steam Beer, which uses a lager yeast. The shallow depth and wide surface area of these vessels serve much the same purpose as their historical versions did, which is to radiate off the heat generated by the fermentation. Although radiant cooling does not bring the temperature down as far as would be ideal for a standard lager, higher fermentation temperatures are an integral component of our traditional and historical process of brewing Anchor Steam Beer. Our ale fermenters are of a somewhat different design. While they are still open, they are essentially square and are much deeper than the “coolship” and as such, they have far less exposed surface area for the volume of wort being fermented. Ale fermentation temperatures are higher than those of lagers so there is no need for radiant cooling. Since these fermenters are open to the air, we have to maintain a very high standard of industrial hygiene in our brewery. Ales and lagers employ different yeasts and are fermented in separate enclosed rooms that are ventilated with filtered air. 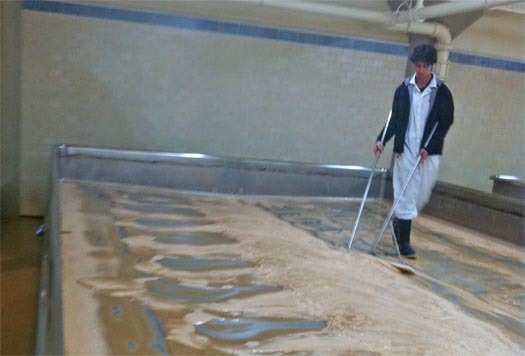 After each brew is finished, the fermenter is thoroughly cleaned and sanitized before the next cycle. 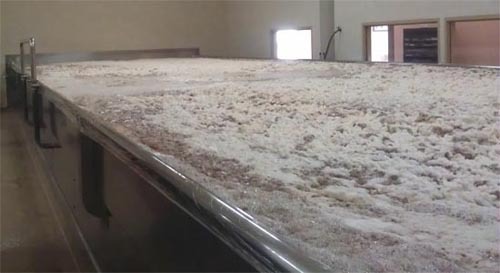 Like many traditional processes, open fermentation involves much more time and attention than one might expect. Even though it does take a bit more work, here at Anchor Brewing we believe that open fermentation is a tradition well worth maintaining.